UNIONDALE, N.Y. — Devon Toews scored his first NHL goal at 1:48 of overtime to lift the New York Islanders past the Chicago Blackhawks 3-2 Thursday night for their fifth straight win. 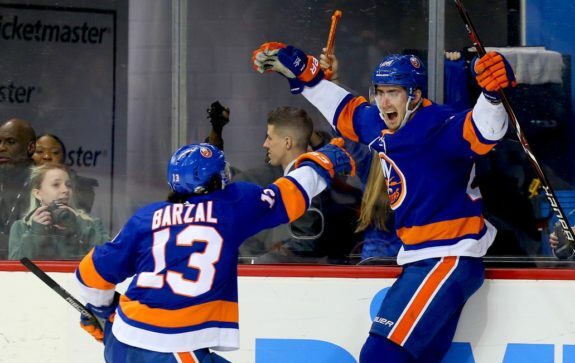 Mathew Barzal scored twice to keep up his scoring binge and help the Islanders win for the eighth time in nine games. Robin Lehner, making his third straight start, stopped 19 shots as New York moved to 3-0-1 in four games at the Nassau Coliseum this season. [caption id="attachment_470055" align="aligncenter" width="575"] New York Islanders center Brock Nelson celebrates with center Mathew Barzal (Andy Marlin-USA TODAY Sports)[/caption] Toews, playing in the fifth game of his career, got the winner when he knocked in the rebound of his own shot that Collin Delia stopped, with the puck coming to him at the right side. Patrick Kane and Dominik Kahun and scored for Chicago, which lost for the third time in their last five. Delia, making his third start of the season and sixth of his career, finished with a career-high 47 saves. Kane tied the score with on a one-timer that he didn't hit cleanly and the puck fluttered off the post and in past Lehner for his 23rd at 5:01 of the third. Barzal put New York ahead with a power-play goal late in the second, putting in the rebound of Nick Leddy's shot in front for his 12th with 1:04 left. After extending his point streak to six games with his first goal, Barzal — selected for his first All-Star appearance a day earlier — now has eight goals and 11 points in that stretch. Cal Clutterbuck nearly gave the Islanders the lead earlier with about 6:20 left in the period as he batted the puck out of the air from the right side. The officials conferred on the ice and initially ruled it a good goal. However, it was overturned after a video review because Clutterbuck's stick was above the height of the crossbar when it hit the puck. The teams were tied 1-1 after one period, though the Islanders controlled play for most of the first 20 minutes, outshooting the Blackhawks 14-3. Kahun got Chicago on the scoreboard first. Duncan Keith fired a long shot from the left point and Brandon Saad's deflection in front was stopped by Leher, However, Kahun backhanded the rebound from the right side for his sixth at 3:05. Barzal tied the score at 6:47 with his 11th. Johnny Boychuk's shot from the right point deflected up off Anthony Beauvillier in front, and Barzal batted it out of the air from the left side into the top left corner. It extended his point streak to six games.